Commonly seen in aquariums, sea parks, TV shows, and movies, the bottlenose dolphin is a wildly recognizable cetacean (marine mammal). In the wild, bottlenose dolphins inhabit the temperate and tropical oceans around the world, with coastal populations entering into bays, estuaries, and river mouths. Like the name “bottlenose” suggests, this species of dolphin has a short, stubby beak. Its sleek, conical body varies in color from a light to slate grey on the upper body to a pale to pinkish grey on the bottom part. Bottlenose dolphins measure around 2-4 m (6-12 ft.) long and weigh 135-650 kg (300 – 1400 lbs.). Males are significantly larger than females. A curved dorsal fin in the middle of their back, along with powerful, broad flukes on their tail and a pointed flipper on each side allow bottlenose dolphins to swim speeds up to 35 km/h (22 mph) and dive as deep as 915 m (3000 ft.). They have a thick layer of blubber which helps them maintain their body heat and protects them from predators such as killer whales and large sharks. They have sensitive, smooth skin that flakes off and gets replaced every few hours. Despite the fact that they live underwater and can hold their breath for up to 7 minutes, dolphins must come to the surface to breathe air. A muscular flap covers their blowhole while underwater and opens to exhale once they reach the surface. Dolphins can exhale air at 160 km/hr (100 mph). When they inhale, they can exchange up to 80% of the contents of their lungs. Humans, by comparison, only exchange 17% of the air in their lungs when they breathe. Dolphins aren’t involuntary breathers like humans. They must consciously swim to the surface to take a breath. This means they can never fully sleep. One side of their brain must always be active so that they remember to breathe. Although they have little to no sense of smell, bottlenose dolphins have other well-developed sensory organs. With eyes located at the side of their heads, they have a nearly 360-degree field of vision. They can also move each eye independently of the other, providing even more range. They have strong eye muscles which can change the shape of their lens and allow them to focus both underwater and in the air. They secrete a mucus over their eyes which washes away debris. They also have an excellent sense of hearing. Sounds travel through their lower jaw to their inner ear. Bottlenose dolphins communicate with each other using a collection of chirps, whistles, and clicks. 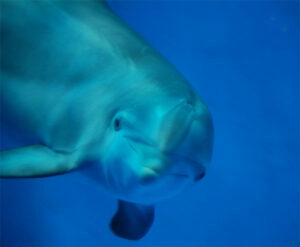 They create these sounds using nasal sacs in their heads and their blowholes. Each dolphin has a signature whistle used to identify itself. 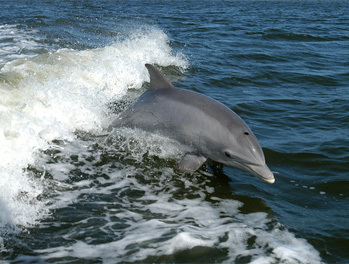 When lost or isolated, a dolphin uses the signature whistle to call out to the group. 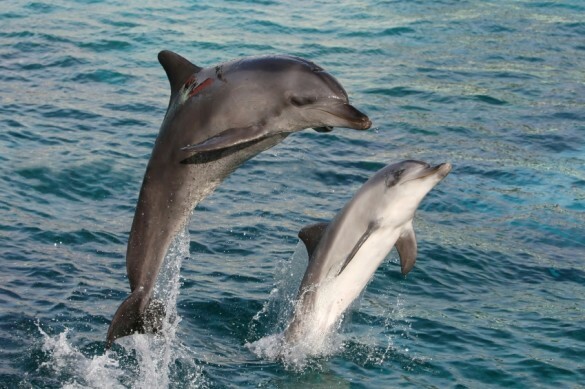 Dolphins produce high-frequency clicks that humans can’t hear. They use these clicks in a sonar system called echolocation. When the clicking sound reaches an object, it bounces back to the dolphin as an echo. Dolphins can process this information to determine the shape, size, speed, distance, and location of the object. 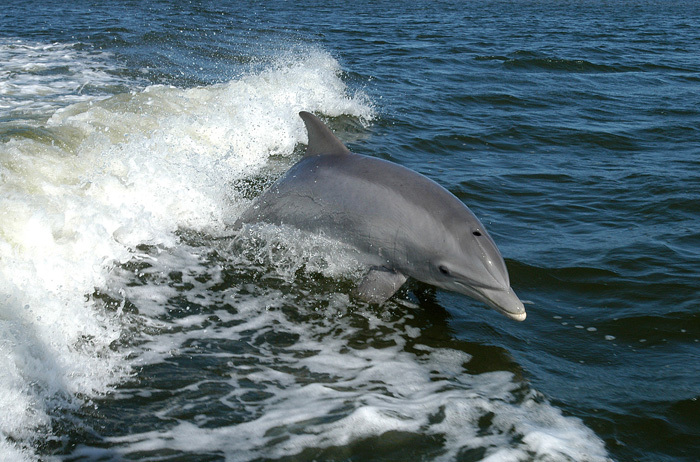 Bottlenose dolphins use echolocation when hunting for fish, squid, and crustaceans. They have 18-26 pairs of sharp, conical teeth on each side of their jaw, but they usually swallow their prey whole. They consume 8-15 kg (15-30 lbs.) food per day. Although they sometimes hunt independently, they also cooperate in groups to capture prey. They take turns herding fish into smaller areas while others swim through and snap the fish up. They also use a hunting tactic called “fish whacking”, where they knock fish out of the water with their tails, and eat them when they’re flopping around on shore. Many times dolphins hunt in conjunction with fisherman, convening around fishing boats. Very social animals, bottlenose dolphins generally swim in groups (called pods) of 10-25. Offshore, they have been seen in larger groups of several hundred. These large groups are called herds. Within their groups, bottlenose dolphins like to play. They surf on waves near shore and ride waves caused by boats and big whales. They have also been documented creating bubble rings with their blowholes, spinning them with their beaks, and then then breaking them apart by biting them. The technique of creating bubble rings is a learned behavior; dolphins watch others create them and then try to mimic the behavior. A video of dolphins creating and playing with bubble rings. Bottlenose dolphins breed year round once they reach maturity (5-10 years for females and 10 years for males). 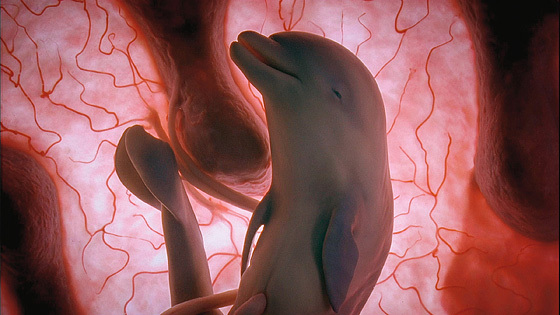 Ultrasound images of pregnant dolphins show that at 9 weeks, the dolphin fetus starts swimming inside the womb. These images also reveal that dolphin fetuses develop hind limbs which later retract and disappear before the calf is born. In fact, in 2006, Japanese fishermen found a bottlenose dolphin whose limbs didn’t disappear. These limbs served as a second set of flippers. This phenomenon of hind limbs developing and then retracting in utero points to the idea that dolphins evolved from four-legged land animals. Ultrasound image of a dolphin fetus from National Geographic’s book, In the Womb: Animals by Michael Sims. After 12 months in the womb, the calf is ready to be born. The calf emerges tail first so that it doesn’t drown. Once fully out, the baby dolphin swims to the surface to take its first breath of air. The calf stays with its mother for 3-6 years, nursing for the first 12-18 months and learning to hunt once weaned. Bottlenose dolphins can live up to 40-50 years. According to the IUCN Redlist, they are a species of least concern. 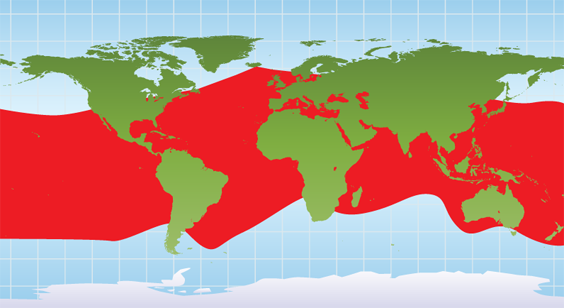 However, they face a several threats, including pollution, virus outbreak, run-ins with fishing gear and boats, and hunting in Japan and Taiwan. Be respectful of dolphins as swimmers, boaters, and fishermen. Keep your distance from wild dolphins, especially mothers and their young. Do not touch or feed wild dolphins. It is also important not to litter. Plastic bags, six pack rings, nets, hooks and fishing line all pose risks to dolphins. Write to your legislator about preserving their ocean habitat and keeping it free from pollution. In the wild, bottlenose dolphins inhabit the temperate and tropical oceans around the world, with coastal populations entering into bays, estuaries, and river mouths. Abi Cushman is a contributing editor of Animal Fact Guide and My House Rabbit. When she's not writing about weird animals or pet rabbits online, she writes and illustrates funny books for kids [about weird animals and rabbits]. Her debut picture book, Soaked , comes out in Summer 2020 from Viking Children's Books.